Ever noticed how your animals know where to pick things in the garden or their environment when not well. Like their larger cousins, domesticated animals are attuned to nature and their environment, they love perfect balance. 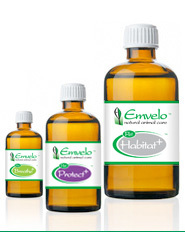 Use the Emvelo range of products to empower your pets to freely develop their full physical potential in a naturally balanced environment reducing the need for drugs. Whether its odour control, annoyance from biting insects or relief from a few sniffles - Emvelo is what you need. Users of the products advise calmer happy and more naturally behaving animals. Promotes peace and calm in a stress free environment. 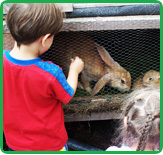 Pet Habitat+ is a spray which is applied to hutches, kennels, aviaries etc including surroundings and bedding. Pet Habitat+ applied to the bedding and surrounds can help suppress any harmful micro-organisms that could cause diseases and the manure will dry quicker making it less odorous. We also recommend applying each time after you clean out your animal habitat or reapply when adding new bedding. Product can be applied to carpets or areas where animals bring in unwanted guests to reduce possibility of infection and infestation. Pet Protect+ is a spray which is applied directly to affected parts of your animals taking care not to spray directly into eyes. The aromatherapy oils and their associated odours create an environment that does not appeal to flies, fleas, tics, midges etc. The product can also be applied to animal toys, rugs coats and leads. Different blend of aromatherapy oils work to deter flies and provide healing where already bitten. The micro-organisms within the product work on providing a better microbial balance on the skin thereby reducing possibility of infection. Pet Breathe+ is a water-soluble respiratory spray comprising blend of the natural essential oils which provides symptomatic relief for breathing difficulties. Emvelo Pet Breathe+ helps to liquefy thick sticky mucous and open up breathing passages. Pet Breathe+ is applied using portable spray with a very fine mist within the animal housing morning and evening for about three days or as required. The product can also be applied neat to halters or rugs.